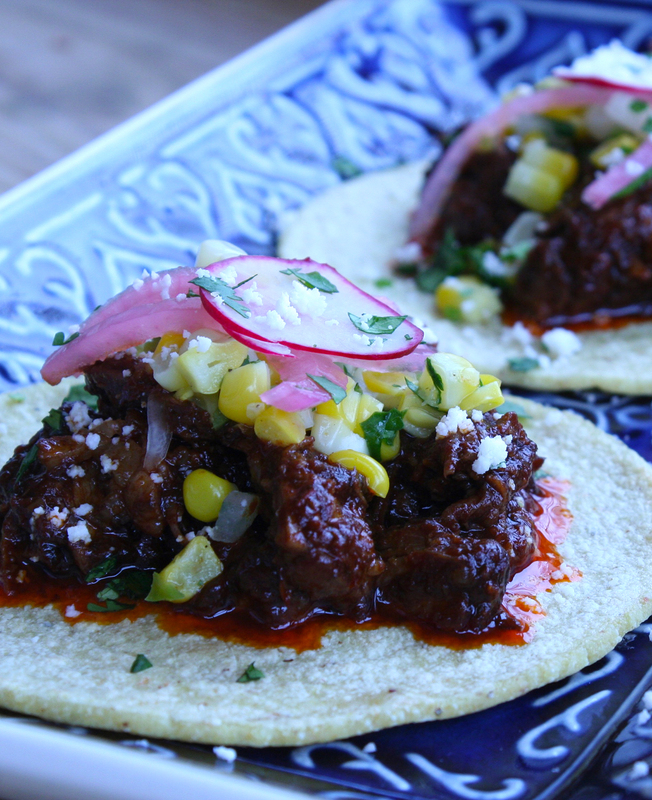 Tender short ribs, slow cooked in chili peppers and hard cider. Short ribs are perfect for a nice long braise. I’ve made these with beer in the past, but I really like the subtle fruity flavors you get from using a hard cider. I combine that with a variety of dried chili peppers, orange juice, and some toasted spices. The meat falls off the bone after a few hours in the oven. 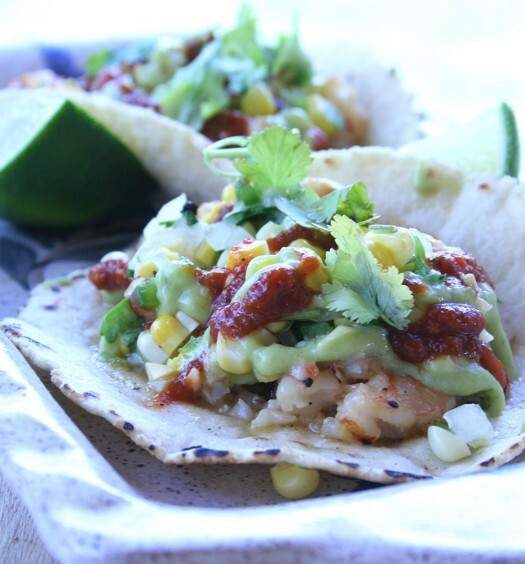 I’ve made these tacos with a variety of toppings, but I’ve found that keeping it simple is best. 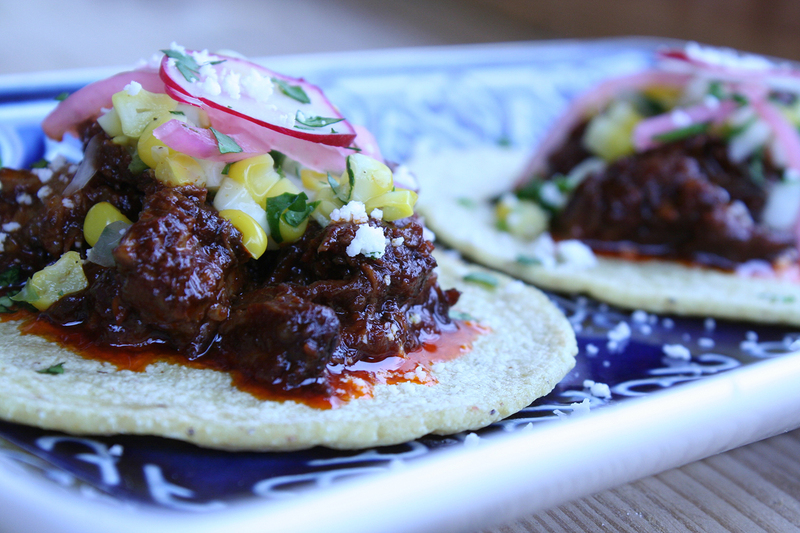 The subtle crunch of corn salsa and pickled red onions work perfectly with the tender ribs. 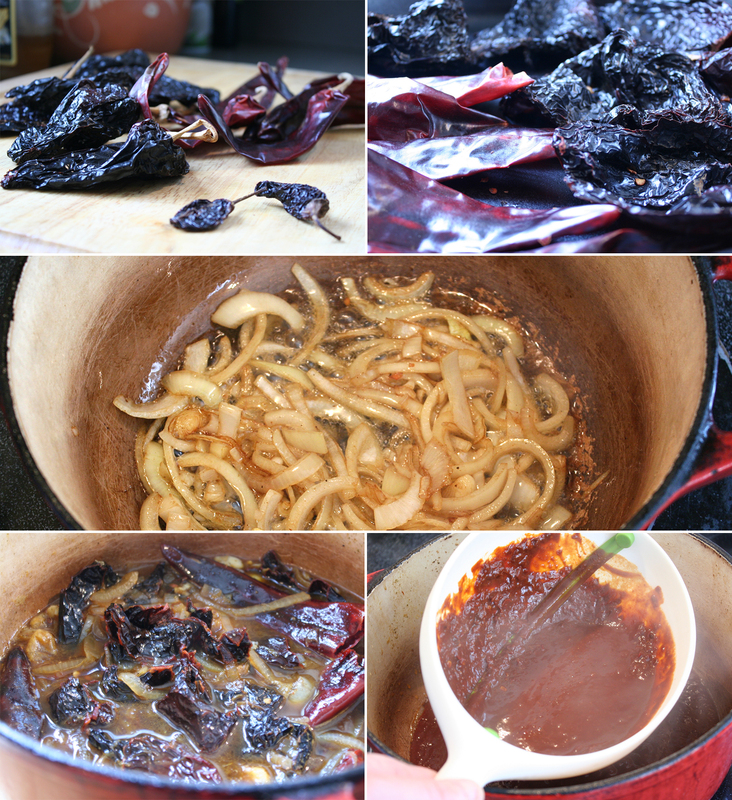 Toast the dried chili peppers in a dry pan, over medium heat for 1-2 minutes until the chilis are fragrant. Make sure not to burn the chilis. Set aside the chilis. Toast the cumin, peppercorns, and oregano in the same pan for 1-2 minutes until fragrant. Grind with a mortal and pestle or spice grinder and set aside. Preheat the oven to 325º. Season the ribs liberally with salt and pepper. Choose a dutch oven or other oven proof pan that will fit the ribs tightly in one layer. Heat the pan over high heat. Add the oil and sear all sides of the ribs in the hot oil. Don’t crowd the pan, you’ll want to sear the ribs in batches. 4-5 minutes per batch. Once the ribs are all seared, set aside the ribs, and reduce the heat in the pan to medium and add the onions. Cook, stirring often, for 2-3 minutes. Add the garlic and ground spices and cook another minute. Add the toasted chilis, orange juice, chicken stock, and hard cider. Bring to a simmer and cook for an additional 5 minutes. Carefully add the contents of the pan to a blender and blend until smooth. Strain the blended sauce through a large holed strainer back into the pan to catch any of the dried pepper skins that the blender hasn’t broken down. Arrange the ribs in the sauce sideways with the bones perpendicular to the bottom of the pan. The sauce shouldn’t completely cover the ribs. It should go about 3/4 up the ribs. Once the ribs are arranged in the sauce, press some wax paper tight against the top of the ribs and place the cover tightly on the pan. Place the pan in the oven and cook for 2 1/2 – 3 hours. If the bones fall easily away from the bones, the ribs are done. Remove the ribs from the sauce and add to a large bowl or cutting board. Place the pan over medium-low heat. Skim a bit of of the oil from the top of the sauce with a large spoon. Cut the lime in half and add the juice and the lime rind to the pan and cook for 10 minutes or so until the sauce is reduced and slightly thickened. Remove from the heat. Remove the bones from the ribs and either shred or cut the rib meat into bite sized pieces and add to the reduced sauce. 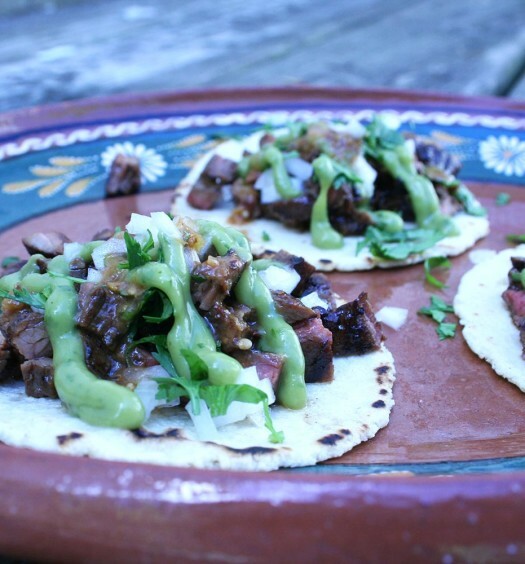 On a hot griddle or pan, heat the tortillas for 20-30 seconds or so per side. 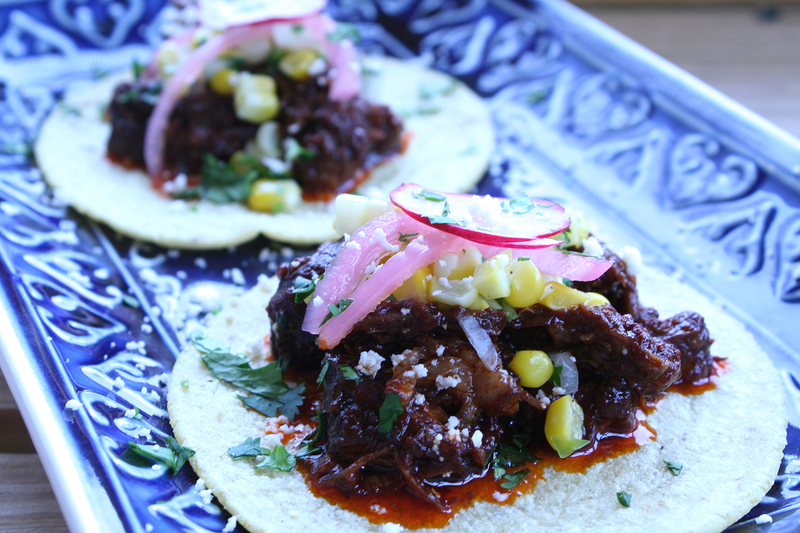 Place a bit of meat and sauce on the tortilla, Top with a little corn salsa, pickled red onions, and queso fresco. Enjoy.